Victory Monument is a well-known landmark worth seeing in Bangkok. Discover the top-notch restaurants and acclaimed art galleries in this culturally rich area. Explore the great outdoors with a trip to Lumpini Park, a popular green space in Bangkok. Discover the acclaimed art galleries and temples in this vibrant area. You can enjoy some retail therapy with a trip to CentralWorld Shopping Complex, a popular shopping spot in Bangkok. Discover the top-notch restaurants and acclaimed art galleries in this culturally rich area. A metropolitan neighbourhood, Bangkok City Centre offers a variety of options for restaurants. The neighbourhood’s China town and rich culture are just a couple of its charming qualities. Other highlights include the local temples and shopping, as well as the natural splendour of the riverfront. Silom is a metropolitan, romantic neighbourhood with convenient options for bars and restaurants. The neighbourhood’s charm comes through in its rich culture. You can satisfy your cultural palate with temples and shopping. 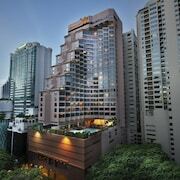 Siam is a welcoming, upmarket neighbourhood. 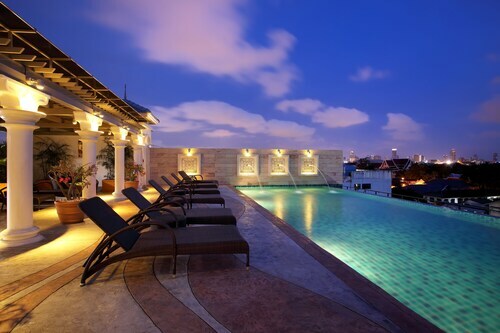 The neighbourhood has many appealing features, among them its friendly people and rich culture. You can satisfy your cultural palate with temples and shopping. 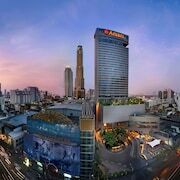 Asoke is a welcoming neighbourhood that’s popular for its restaurants and cafes. You can satisfy your cultural palate with shopping and temples. The Khao San neighbourhood welcomes visitors, with its convenient options for bars. In addition to its rich culture, the neighbourhood has many charming qualities. You can experience the local temples and monuments, or enjoy the natural beauty of the riverfront. It may be noisy and chaotic, but the irrepressible Thai capital of Bangkok is one of the world's essential travel destinations. The self-styled 'City of Angels' is as fascinating – and humid – a city as you're likely to come across, with its many contrasts and idiosyncrasies. It's difficult to prepare yourself for the frenetic speed of life in Bangkok, with its dashing colours, tuk-tuk-jammed highways, strong aromas and general absence of native English-speakers. The tourist honeypots are a must during your visit, but you venture off the beaten track when you can. You'll be delighted by a wild, authentic taste of urban life in Southeast Asia. The hectic streets of Bangkok are always alive with street vendors and market traders. Among the rows of stalls selling traditional Thai food you'll also find cheap clothing, souvenirs, electronics and pretty much everything in between. On the famous Khao San Road – popular with backpackers and other foreign tourists – you can shop, eat, drink and mingle among the eclectic crowd. The market in lively Banglamphu is a treasure trove of bargain goods extending over Phra Sumen Road and Chakrapong Road – it's worth a good look around. Once you're done with shopping, go for a relaxing yoga class or head to a bar to cool off from the tropical conditions. You might associate Bangkok more with its nightlife, but tradition and religion are integral to daily life in Thailand, as demonstrated by the many beautiful shrines and busy Theravada Buddhist temples. Some of these have become major tourist attractions, including Wat Phra Kaew – the Temple of the Emerald Buddha – which sits in the grounds of the magnificent Grand Palace, and the giant reclining Buddha within Wat Pho Temple. Wat Arun – the Temple of Dawn – Wat Benchamabophit and Wat Saket are also architectural gems. Dress modestly, brush up on your etiquette, then jump in a tuk-tuk and hop between the main cultural sites. No visit to Bangkok is complete without a trip to the Grand Palace, a spectacular complex of buildings that's been home to Thai Royalty since 1782. The buildings, halls, and pavilions are set around attractive gardens and courtyards – a calm contrast to the Khao San Road. Although this huge palace remains occupied and continues to be used for ceremonial events, part of it is open to the public as a museum. If you're not able to make the journey north to Ayutthaya, to the ruins of the old capital, this is the best place to learn about Thailand's fascinating history. Many of the hotels in Bangkok offer spectacular views across the historic capital, but one of the best ways to see the city is from the water. The Chao Phraya, the main river, plots a course through the working city, and makes for a very different viewpoint from the streets. You can drift along the river on a long-tail boat or plush cruiser, taking in the temples, bridges and waterside neighbourhoods, where the huts hang perilously over the riverbanks. The city's network of historic khlongs – or canals – allow you to explore the oldest parts of Bangkok without getting stuck on the busy roads. Bangkok's versatile street vendors offer an incredible range of tasty dishes, cooked and served before your very eyes. Wherever you are, there'll be somewhere to fill up on tom yum goong, gaeng daeng and som tum and the omnipresent pad thai. On the street, in the food malls and in Bangkok's traditional restaurants there are countless soups, salads, curries, seafood dishes and desserts to work your way through. 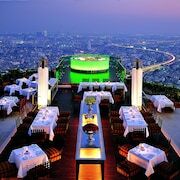 If you're staying in luxury accommodation in Bangkok, you'll often find there's a restaurant worth visiting downstairs. 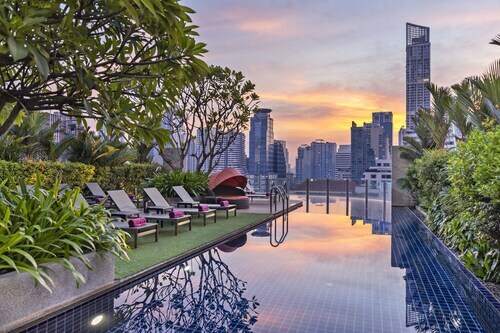 You won’t be short of options when it comes to accommodation in Bangkok. 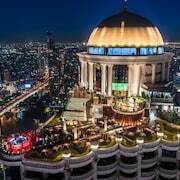 The Thai capital has a long-established tourist industry, which caters for all budgets and tastes. 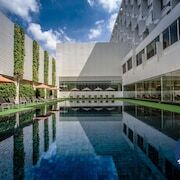 If you're seeking a five-star hotel in Bangkok, there are lavish establishments including the Siam, the Okura Prestige and the Mandarin Oriental. At the other end of the price spectrum, there are hundreds of backpacker hostels and cheap hotels in Bangkok, particularly among the hotels near Khao San Road. Planning a trip to Thailand beyond Bangkok? 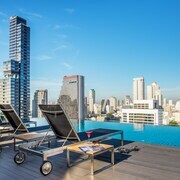 Explore some of the country's other destinations with deals on hotels in Chang Mai and Koh Samui hotels. Explore Bangkok with Expedia's Travel Guides to find the best flights, cars, holiday packages and more!